The more guests Milena welcomes in her home via AirBnb, the more ideas for posts we seem to get from them. We’ve already covered Skopje as a travel destination in general as well as listed several Skopje sights that can be enjoyed for free. Milena was even nice enough to prepare an entertaining guide on how to make different types of coffee in her kitchen too. After endlessly answering the same questions about Skopje repeatedly, she thought that it would be a great idea to give some insider information of North Macedonia’s capital – Skopje; after all, no tourists can have enough info about a place they’re about to visit for the first time. Can I use credit/debit cards in Skopje? One of the top questions is always related to money. Besides being able to find numerous money exchange offices around the city, tourists can also use their credit/debit cards in most shops and restaurants, too. Plus, there are also lots of ATMs around the city, so you’ll be able to withdraw cash from them too. Thus, there’s no need to worry about not having enough cash with you. In North Macedonia, the credit card machines at stores require a PIN code. Don’t be alarmed if your credit card is with a signature only. Just let the sales person know it doesn’t require a pin. Can you tell me more about public transportation? Skopje only has buses as public transportation. To ride on these buses, you must have a bus pass, which looks like a credit card. These need to be bought beforehand and can be found in one of the following selling points. A single bus ticket costs 35 MKD (Macedonian Denar), but the electronic cards feature several rides that expire within a week (if it’s a brand-new bus card). The same card can be filled up with a specified amount and reused for new bus rides. The money amount on the card do not expire. Keep in mind that if you’re traveling with one or more friends, it may be better to take a taxi since the city isn’t too big. Sometimes it may be even cheaper to take a taxi instead of using public transportation. What are the must-see spots in Skopje? Those looking for an authentic Skopje adventure must visit the Kale Fortress, the Stone Bridge the Skopje City Museum and the Old Bazaar. Also, it’s highly recommended, if you have the time, to check out the mountain Vodno, take a ride in the cable car and see the Millennium Cross on top of the mountain. Naturally, when you are exploring Skopje you won’t miss the Skopje 2014 project buildings. For example, the large fountain on the main square as well as the Triumph Gate. 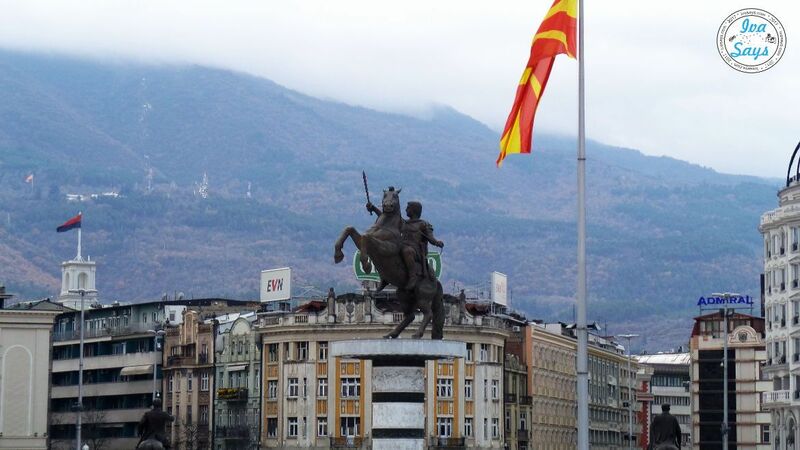 For more things to see in Skopje check out my travel guide. What are the working hours of museums in Skopje? On average, the working hours of museums throughout Skopje are from 9 am until 4 pm or 5 pm every Tuesday through Sunday. All museums are closed on Monday in Skopje. The cable car that takes visitors to the Millennium Cross on Mount Vodno is also closed on Mondays and every last Tuesday in the month.You can get the working hours for the cable car to mount Vodno here. There are certain museums that might be closed on Tuesdays as well, so check with each individual museum before planning your trip to visiting Skopje. Is Skopje an expensive city? Generally speaking, tourists from the USA and the EU countries find Skopje to be a relatively cheap city. The prices of the public transportation, taxi, groceries etc. are low for those that live in countries with high living standards. The same applies to bars, coffee shops, and restaurants; the only exclusion from this rule are elite dining spots where the prices are fairly high. In terms of shopping, I believe that depending on the shop you can find both cheap and expensive deals; naturally, in the shopping malls the prices are higher as the stores often offer branded clothes, shoes, and accessories. How to get from and to the Skopje Airport? Thanks to the many cheap flights to the Skopje Airport, lots of tourists arrive by plane. So, what are the options for getting to the city from the airport is another question that needs to be answered. The first option is the airport shuttle whose schedule can be found here(this link opens only via the desktop version of the website). As you can notice, the ticket price is 175 MKD or around 3 euros per person. However, keep in mind that sometimes the shuttle gets full and you may need to wait for the next one or take a taxi instead. There are various bus stops (you can see them on the schedule), with the Hotel Holiday Inn being the last one as well as the one right in the city center. In terms of taking a taxi, there’s only one company available and its cars are parked right in front of the main building.They all have a fixed price of 20 euros. Sometimes, the taxi drivers may agree to take several people, and this may be even more affordable than the bus. How to get to Canyon Matka? Visiting Skopje is a great opportunity for visiting the marvelous gem of nature – Canyon Matka. And, if you love exploring caves check out Cave Vrelo at Matka for some extra touristy activity. Since Canyon Matka is around 16 kilometers away from the city, getting there may be a challenge to tourists. However, it’s actually not that big of a deal to get there since you can both take a bus or a taxi, depending on what your budget approves more. Those going by bus can catch the bus line 60 to Matka, which can be found at the main bus station in Skopje. A taxi can be found on the streets, at taxi stations, or you can call for one. I personally recommend the last option because that way you can call a trustworthy company rather than risking riding with an illegal driver that will rip you off. Depending on your location and the traffic jam, the ride can cost you around 500 MKD or less than 10 euros. Keep in mind that bus rides usually last longer because of the many stopping points, so if you want to save time taxi is probably the better option. Does Skopje have a city park? Yes, Skopje has a nice city park, which is situated by the Vardar River. The park itself is not too big, but it does feature small lakes and ponds, spots for picnics, and walking paths. So, those that want to enjoy the nice weather without leaving the city can go to the City Park for a relaxing day. Moreover, by the Vardar River, you can find a biking track, several bars and cafes, and even outdoor exercise equipment. During the summer, the park is also filled with mobile coffee shops, ice-cream stands, hot-dog stands and so on; thus, it can be the perfect place for a budget-friendly adventure. Nearby the park is the Skopje City Zoo. Hotels, hostels, Airbnbs… you can find everything in Skopje; your choice would probably depend on your budget. Naturally, hotels are pretty expensive, some are even as expensive as hotels in top European spots; thus, options like Marriott, Alexander Palace, and City Park Hotel are often reserved for business travelers. Those looking for cheaper options can stick to hostels whose prices are often affordable; however, make sure to read reviews since not all of them are clean, warm enough during winter etc. Naturally, Airbnb has recently become very popular too; therefore, there are lots of options (private rooms, entire homes and so on) for travelers that want to make the most out of their trip, meet locals and get insider info about the city. I personally recommend, Milena’s place since it’s close to the city center, next to the park and local bars/restaurants with a fairly inexpensive price. Where and what to eat while in Skopje? Well, this is a very broad question since there are many options when it comes to restaurants in Skopje. Since Milena’s place is in Debar Maalo and near the Bohemian Streets, I’d say that any place on the streets works. My personal favorites are Chardak and Skopski Merak, with the latter being a bit more expensive. There are also lots of options in the City Center, along the Vardar River; my top choice for that region would be Plaza de Toros. Royal Burger, on the other hand, is a fast food place with cheap and tasty food. Silbo is a popular bakery that works 24/7 and has awesome and always fresh stuff. 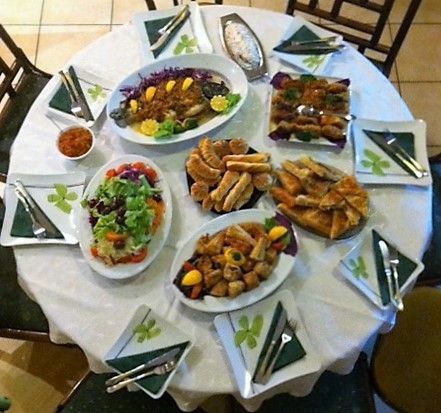 In terms of what to eat, there are both local and international options offered to tourists. For example, both Chardak and Skopski Merak have traditional Macedonian dishes like “tavche gravche” (beans prepared in a special way), “ajvar” (a dish made of minced red peppers), “musaka” (minced meat and potatoes in a pot), “sarma” (cabbage rolls filled with minced meat), “pindjur” (sold spread made of various roasted vegetables), “selsko meso” (a dish prepared in a clay pot consisting of pork or beef and onions, mushrooms and various spies) and traditional pies. 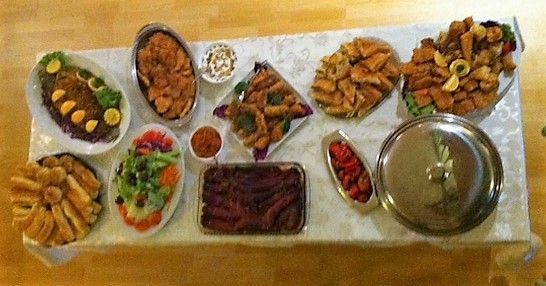 Often, they have special boards known as “daska” that is perfect for several people and that include small servings of various traditional dishes; thus, you can try many things without overeating or overpaying. Also, it’s a must try “kjebapi” (a grilled dish of minced meat like the form of a sausage), which can be found in any “kafana” (traditional restaurants found in Balkan countries) as well as in the Old Bazaar in Skopje. Check out our vegan and vegetarian food guide to Skopje for meatless options! Macedonian food including salads and barbecue. Is Skopje a safe city? Yes, Skopje is generally a safe city. Most neighborhoods are safe and often crowded with people. For example, Debar Maalo is popular for the numerous restaurants and bars that work till late at night; therefore, its streets are often full of people and well lit even during the early hours of the day. One thing that is possibly the biggest issue regarding safety is the traffic, since every day there are lots of car accidents. Thus, it’s recommended to be careful while driving and/or crossing the streets – this applies even when you’re crossing on pedestrian crossings! Is the air in Skopje often highly polluted? 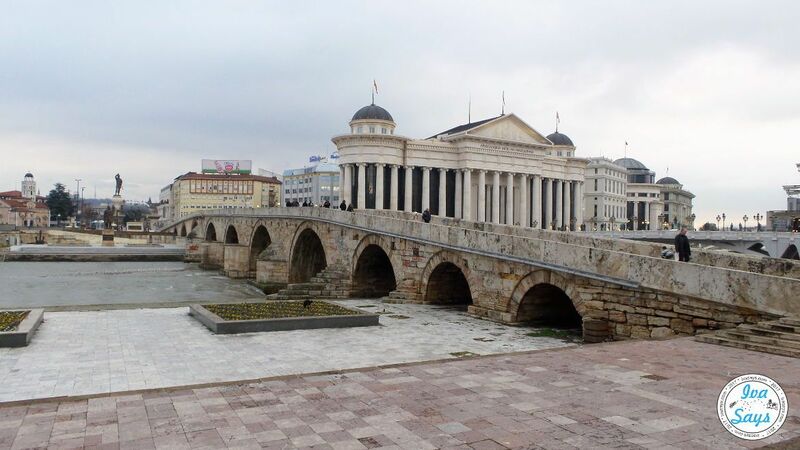 Recently, Skopje has been making headlines as the most polluted city in the world. However, this phenomenon is a major issue only during winter. 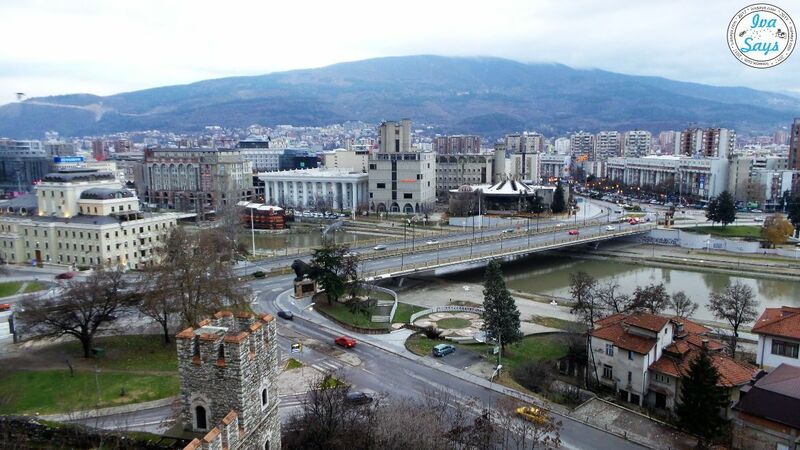 Namely, Skopje is surrounded by mountains and during the cold weather months, the air tends to get heavily polluted by the lack of wind as well as households that heat on wood, traffic, and coal-based industries. Those traveling during winter can check the air quality in Skopje online. It’s highly recommended to purchase air-filter masks. They are available in any pharmacy in Skopje and North Macedonia. That’ all we could think about for now. If you’re planning on coming to Skopje and have a question that’s not included in this list, please feel free to share it in the comments and I’ll try to answer it the best I can.